They were staying at the Drury Hotel, which is a recent venture, carved out of the former Board of Education building on East 6th Street. Twenty-five years ago we saw candidates Bill Clinton and Al Gore speak before a tremendous crowd from a platform in front of that building. 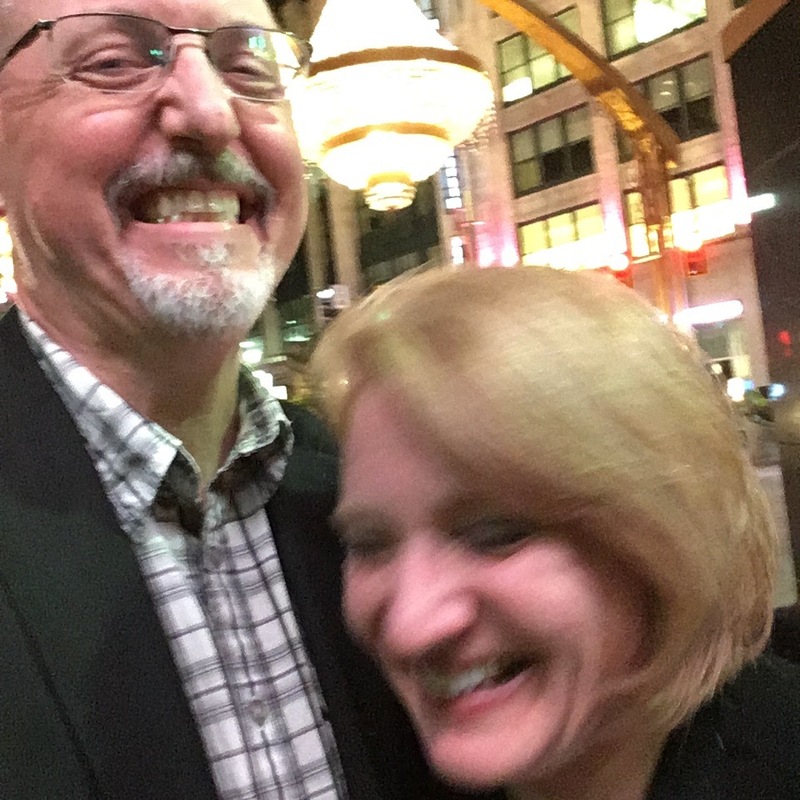 Julie suggested we have a drink in the lobby, but she hadn’t really been to Cleveland since the early 1990s. I thought we might do a little better. 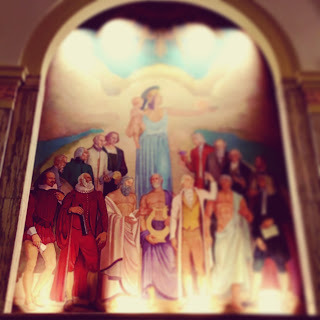 I met her in the lobby, which features these two amazing, restored murals from 1931. Her mother was staying in for the evening, and she had already tied one on so I knew we were in for a good night. Instead of heading out through the main entrance, I noticed that the rear of the lobby opens onto Veterans’ Memorial Plaza. Had she ever seen the Fountain of Eternal Life? Indeed, she hadn’t. She was impressed, and so was I. I always am. It was just after dusk, and the weather was just perfect jacket weather. The streets were alive with people, neither team was playing that night, and it was a Tuesday, but many were out enjoying the weather. We ambled through Public Square. I felt wistful, we all, my family, my co-workers, we spent a lot of time visiting and hanging out there the summer before. Good Lord, the convention and all the rest. The kids running through the fountain. But it was like we’d never even been there this summer. We just hadn’t. I was surprised and delighted to see the large, metal “free speech” art installations by Lek (Olalekan Jeyifous) and we made our through the square heading for our ultimate destination, which was East 4th Street. I didn’t really know which bar we would choose, I just wanted to impress her by showing off the street. The Greenhouse Tavern (which is my favorite restaurant, anyway) had a board out touting it’s rooftop bar, and that was enough for Julie. Up we went. We sat at the bar and we talked. We talked for a long time. We talked through one old fashioned, and then two, at an open air bar, the screen showing some basketball game (not the Cavs) with a narrow view of the slice of the roof across the promenade, the Terminal Tower, the colorful, hanging light bulbs of East 4th Street. We remembered old friends, and boyfriends and girlfriends (yes, even one another) and what it is like to raise teenagers, in Cleveland, in Alaska, in Trump’s America. Social media has afforded us all the opportunity to make contact with, and even continue and grow, relationships with people who in an earlier time we may never have seen or communicated with again, from childhood, high school, college. But what is the nature of that communicate, and what does it mean? That we’re still cool with each other? We mostly agree on things? We make each other smile? Taking, grabbing the opportunity to sit and talk, for hours, with someone with whom you have a shared history. That’s what we’re missing when we think we’re staying in touch through Facebook and the like. Julie and I barely scratched the surface, but I learned things that were new to me, events I hadn’t heard about or worse, entirely misunderstood. I have spent a great deal of my forties digging deep and regretting certain decisions I made a very long time ago, but she made me remember why I had made those decisions and some of them actually made sense. It was a great relief. The bartender gave us a last call, which made me believe it was very late, so instead of having one last at the Greenhouse we hit the street because I had to show her where I work. We walked to Playhouse Square, where nothing was really going on on this Tuesday night, they were in tech for A Midsummer Night’s Dream at the Hanna Theatre, but we took a peeked through the windows, and took our chandelier selfie. Parnell’s was still open so I checked the time and realized it was only just past nine, which was only how late the patio at the Greenhouse was staying open on a Tuesday night, silly me. Well, I had to show her my favorite bar so we went there for another and more reminiscence, sitting out on the sidewalk which is the best place to be. Some time after ten, the server asked if we wanted another round and Julie said I have to drive eventually and should probably have a glass of water, but that she’d have another, which was perfect. And so it went. She suggested getting a car to take her back to the Drury but I insisted on walking. How many more night’s like this would there be this season? Just when we reached 6th street it began to lightly rain and we said our goodbyes at the door. I had almost reached the sidewalk when I heard her calling for me. I ran up to the portico, out of the rain, a bit apprehensive as to why she would call me back. It was the music system. They were playing Tom’s Diner.